My Sweet As Honey Hubby called me from Starbucks today…not to ask if I wanted a coffee brought home, but to tell me he was going to spend the day in meetings and I should craft to my hearts content…I giggled and told him I’d try and fit that in between loads of laundry! Then I took a sip of the mocha that I had gone and picked up myself and came to the realization that I had just been given a free pass to the craft room. No Miss B looking over my shoulder, no hubby to distract me (yes after almost 7 years together he still distracts me). I’m not sure if I stopped before pulling out from the espresso stand. I am participating in an upcoming blog hop with the You’re the Bomb Stamp set (you can order it here) cute as ever and $3.00 from every sale goes to Operation Smile, it’s a MUST HAVE for your stamp collection! I knew I wanted to use the Honeycomb shape instead of circles so I stamped them in Sorbet, Flaxen, Glacier and Chocolate and then punched them out. I then laid them out on my Versamat to see what size base card stock I needed. The Versamat is one of my favorite tools from Close to My Heart – the grid helps me line things up perfectly, flip it over an the foam side is perfect for stamping on! 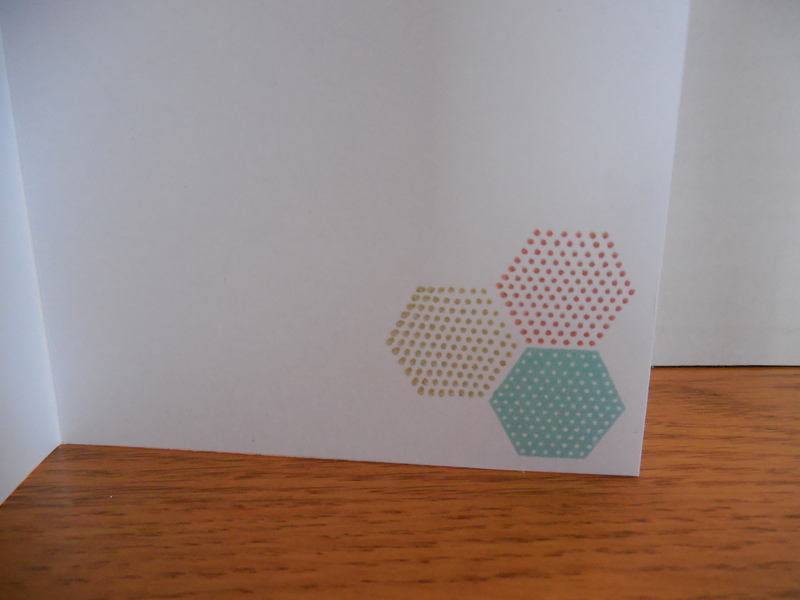 I repeated the hexagon shapes in flaxen, sorbet & glacier to bring in a little punch to the inside bottom corner of the card. Monday I locked (ok, really I didn’t even shut the door) myself in my craft room and started creating, I was on a card making frenzy! I reached for papers that I hadn’t used in a while and combined them with accessories that I don’t use often and had the time of my life. 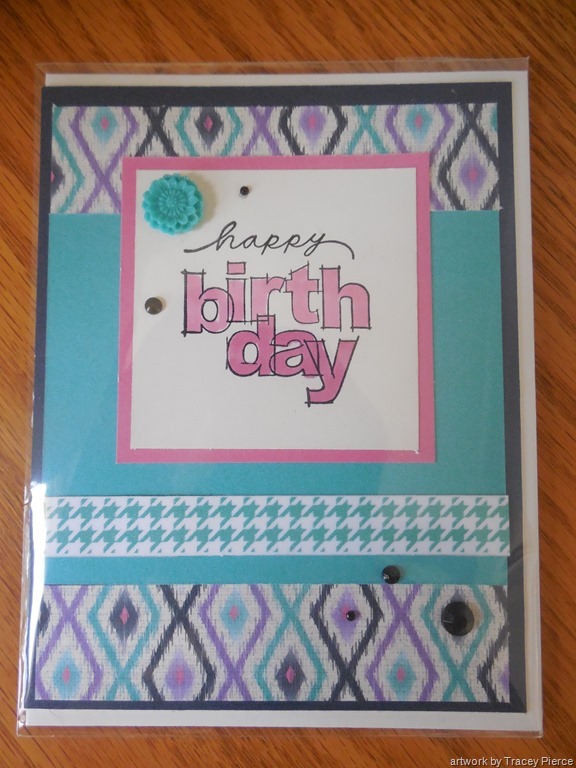 This girly birthday card was made using the Sarita paper packet and one of favorite stamp sizes “M”. These stamps may be mini but they pack a mighty punch! I finished the card off with a piece of lagoon Washi tape mounted to a white strip of cardstock, a teal flower from the Skylark collection and some black sparkles. Uninked stamps…oh my! Say it isn’t so! 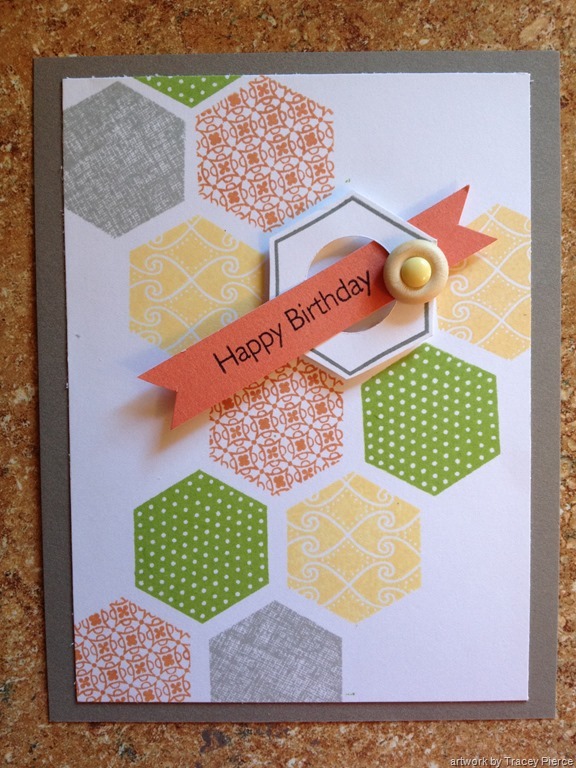 Although I have had this Honeycomb stamp set for some time and have had plenty of ideas for it – my inspiration came while browsing through a competitors stamp catalog. 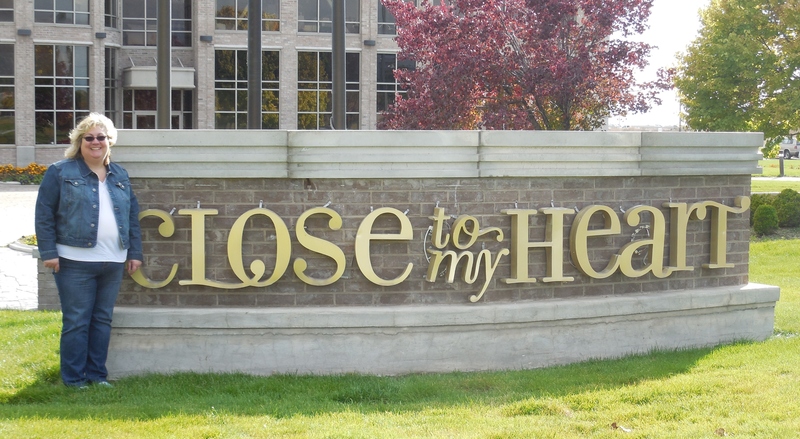 I know, it’s really hard to believe that anyone would think there was another stamp company after learning about Close to My Heart, but there is! I randomly chose colors from my ink tower – Sunset, Buttercup, Pear and Slate and randomly stamped various hexagon images on my page. I then used my cricut to cut a circle and then lined up the hexagon frame and fussy cut around it. I then added the Happy Birthday banner which I stamped on a scrap of Sunset paper and cut it into a banner shape. I pop dotted the entire frame and topped it off with a wooden accent from the Babycakes collection. 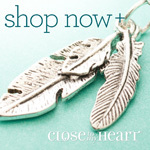 Thanks for stopping by…I hope you’ve found some inspiration to use in your own crafting!